Forces of the Syrian army have attacked a number of foreign-backed militants who were trying to infiltrate into the country from Lebanon, Press TV reports. 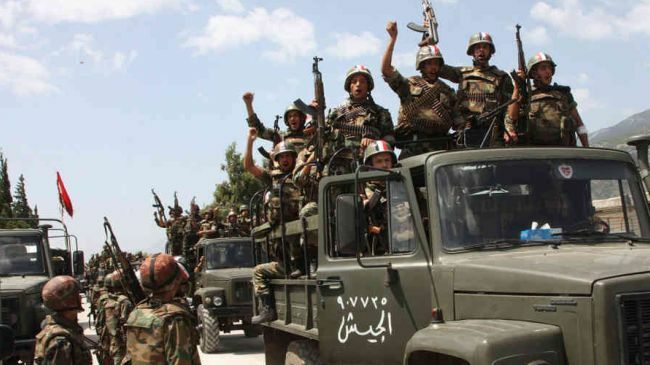 The Syrian soldiers foiled the attempt by killing a dozen militants and injuring many others on Wednesday. Over the past months, the troops have blocked such attempts on many occasions. Syria has been gripped by deadly unrest since 2011. According to reports, the Western powers and their regional allies — especially Qatar, Saudi Arabia, and Turkey — are supporting the militants operating inside the country. According to the United Nations, more than 100,000 people have been killed and millions displaced due to the turmoil that has gripped Syria for over two years. Two million Syrians are expected to take refuge outside the country while another 2.25 million are predicted to be internally displaced next year.